The SPIFFY Awards Ceremony will be held the first night of the 2015 Telecom Council Carrier Connections (TC3) Summit, September 30-October 1 at the Computer History Museum in Mountain View, Calif. 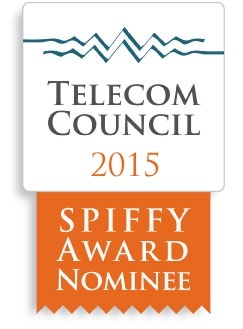 The Telecom Council of Silicon Valley is pleased to announce the nominees for the 2015 SPIFFY Awards. Nominees are selected by the Telecom Council’s Service Provider Forum (SPIF) from among over 200 early-stage companies representing a broad range of telecom products and services who presented in Telecom Council meetings June 2014 through May 2015. Each company invited to present at a Telecom Council meeting has been identified as promising telecom company. Among these, some young companies stand out for their innovation, market opportunity, or quantifiable interest among the Council’s 30+ global Service Providers including AT&T, BT, DoCoMo, France Telecom/Orange, Swisscom, Verizon, Vodafone and many other fixed and wireless carriers from Europe, Asia, and North and South America listed on the Telecom Council website. SPIFFY Award winners will be announced by members of the Council’s Service Provider Forum in a public ceremony, on day one of the annual TC3: Telecom Council Carrier Connections Summit, September 30th at the Computer History Museum in Mountain View, Calif. SPIFFY finalists will attend the ceremony joined by numerous telecom professionals, including the senior executive carrier speakers from the summit. The SPIFFY Awards ceremony is open to the public who may register at www.telecomcouncil.com/tc3. Telecom is really about helping people communicate, historically that has meant connecting one with another, but now can mean connecting many with many, or connecting people to machines. This award recognizes the company that advanced the noble cause of improving telecommunications. Some ideas are so unusual they surprise you, but it’s a small minority of these that are also likely to succeed. With this award, we recognize the startup that brings the most innovative ideas, but also the ability to successfully bring that idea to market. This award is for the most game-changing startup to present to the Telecom Council. It is offered to the company whose progress is most likely to disrupt markets and change the way people do things. This award recognizes the best investment opportunity within the fixed telecom sector that we’ve seen at SPIF meetings in the past year. This award recognizes the best investment opportunity within the mobile telecom sector that we’ve seen at SPIF meetings in the past year. This award is offered to the company that has produced the most impressive technological advancements. These are the firms who have invested in R&D, and have turned the gears of progress through sweat, tenacity, and a Costco account for Jolt and Mountain Dew. This award is given to the pre-2013 SPIF-presenting company that went on to achieve the most notable growth, market success or exit.